During this time of year, I thought this might be a nice way to use up/recycle scraps of wrapping paper and holiday cards. This is a variation on the ribbon canvas I made a few months ago. (and I happen to be using it to mail something)! 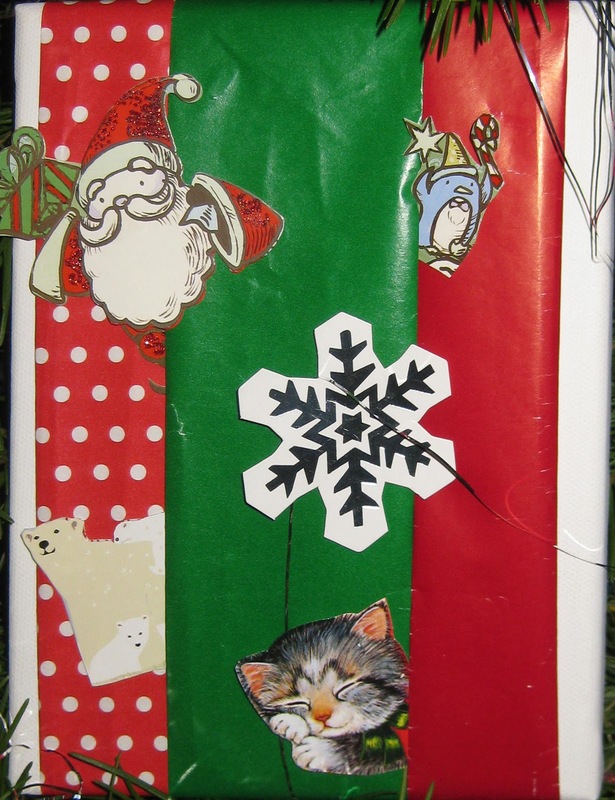 Cut strips of wrapping paper (whatever width you want). I folded the strips length-wise to create a clean edge. Tape each end of the wrapping paper strip securely to the back of the canvas, as shown below. I like the idea of taping the strips down because if you want to reuse the canvas, it's easy to remove. If you want to make this more permanent, staple the strips down. Once you've taped the strips of wrapping paper down, you're almost done! Play around on how you would like to lay out the strips. You can spread them out so you have some space between them or have them overlap as shown. Next, just get some Christmas cards and cut out some of the pictures to use on your canvas. Play around with laying out the different cut outs. I like having them poke out of the strips. Just tape or glue the cut outs to the canvas and you're done!